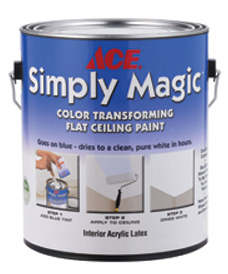 Ace Simply Magic Ceiling Paint was specially designed to make applying ceiling paint easier. When the patented Simply Magic blue tint additive is added to the paint, it creates a distinct contrasting light blue color making it easy to distinguish the new finish. Simply Magic Ceiling Paint eliminates the problem of non-uniform application allowing the job to be completed more quickly. The blue tint “magically” disappears within 24 hours resulting in a beautiful, evenly applied finish. 1. Add the blue tint into the paint. 2. Stir thoroughly until mixed. 3. Apply to the ceiling. 4. Blue tint will disappear within 24 hours. 5. Enjoy a brand new, beautifully finished, pure white ceiling. 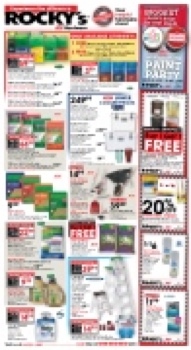 Ace Simply Magic is available at all Rocky’s stores.